What brought you to Bumbershoot Aerial Arts? I was searching for a new and unique way to exercise and challenge myself. What is your favorite apparatus to work on? 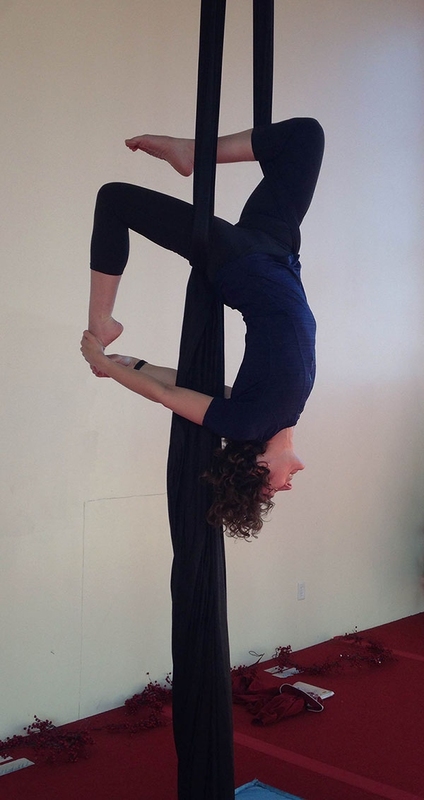 I love silks, but i hope to try slings and hoop someday. What is your favorite thing about Bumbershoot? What kinds of things do you do when you aren’t hanging in the air? I am a cat-loving, yoga practicing chiropractor who also loves to read, knit and travel. I also love baking, especially for my 100-year old grandfather! so many... but I find a warm peach-raspberry cobbler with vanilla ice cream pretty hard to beat. When you are having a tough day in class, what do you tell yourself? my body is different everyday. This is practice and I have to keep working on my skills. What is your favorite trick? Least favorite? I find the Rebecca split sequence to have a meditative quality, my least favorite is the frog slide, i donâ€™t slide well... just ask my classmates and Jerome! If you could run away to a desert island with one person from Bumbershoot who would it be? Do you have a favorite memory from class or performing? the exhilaration of learning a new drop is pretty amazing, but the day a Russian climb became much more efficient was great.